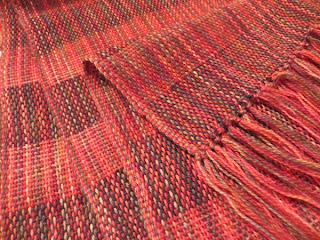 That's pretty much the end of the scarf I've been weaving since October, and I cannot tell you how glad I was to see the end of it. It was easily the roughest project I took on this year. 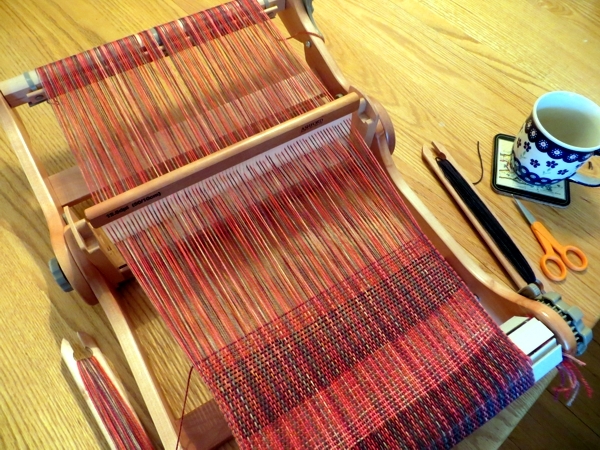 You know what - even though having and using a loom is a very practical solution to a lot of problems, there is just so much about weaving I don't love. To finish this thing I had to make myself think about all the objections and how to correct them, in spite of the fact that moaning over it all is so much more satisfying. Bottom line? I always get a sore back doing it. So I put a cushion onto the back of the chair I use and voila! So much easier to finish a project when you're not in pain. Another brilliant innovation that might help you some day was to play a lot of Christmas music while I worked - that kept me from getting too bored while reminding me why I was sitting in that chair in the first place, though I suppose that would have only seasonal effectiveness. 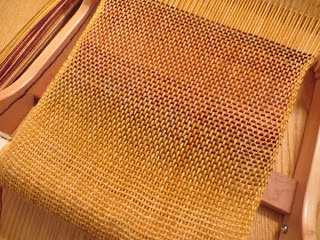 I mean, if I try to weave some scarves in January to cut down next December's pressure, my brain would probably notice the trick. Of course, if I'm really tired, I might still get away with it. As you're finishing off a marathon project like this your thoughts are guarantee to turn to what's next, 'what's next' hopefully involving some sort of delightful form of procrastination. In my desperate state however, it was all about finishing off the next gift knit. I took a break to check on a gift knit I'd set out to dry a couple of days before. I wanted to be sure it was right, because my next job was to knit a second gift just like it except for the colour. Obviously, I was going to have to reknit Gift A in new yarn, and I was also going to have to come up with a new idea for Gift B. A stash-yarn investigation proved that I am pretty much out of bulky yarn that knits up fast, and there wasn't any time to get to a yarn store either. I was going to have to improvise. I came sadly back upstairs and looked at the scarf I'd just pushed my way through, and I tied off all the ends, and I picked it up and draped it over my shoulders and looked in the mirror. The sides are absolutely not straight, but it still looked awesome. So awesome that there was very obviously only one solution to my problem. 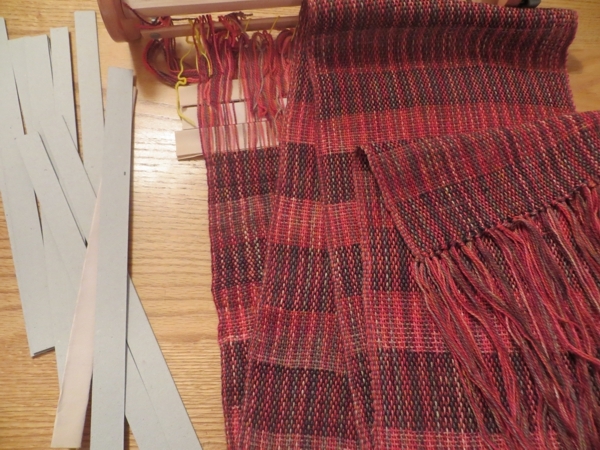 yep, I had to start a whole new scarf. But that's also a whole new story - so drop by again tomorrow and I'll tell you how it came out! OMG! I can't believe you started a new weaving after all the complaints about the first scarf/shawl...which is lovely, BTW. I attempted weaving ONCE...that was enough for me. Making any gift when in pain...life's too short...I'd have walked thru a blizzard to the LYS to get the bulky yarn. You're a very brave woman. oh, and Laura has some really good tips about keeping your body happen when weaving. Google Weaving a Life. 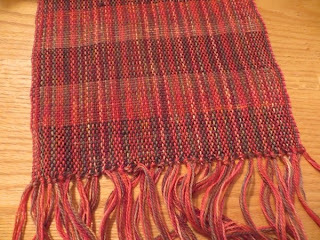 Joan, you are sweet but I suspect it's more about 'crazy' than 'brave' ;^) The story does have a happy ending though and it's not just that the loom's folded away for the rest of the season! Leslie, I keep the tension pretty tight but it's your mention of 'beyond what I thought was reasonable...' - I'll try turning that crank a little farther and see what happens next time, thanks!